Cowboy Homestead Cabins is centrally located between 5 beautiful National Parks and the Grand Staircase-Escalante National Monument. This route is EXTREMELY scenic, and passes Bryce Canyon National Park, and the new Grand Staircase-Escalante National Monument. There are quicker routes, but this one is by far the most beautiful. Depart Las Vegas via I-15 headed north into Utah. Continue on I-15 north through St. George, towards Cedar City. Exit I-15 in Cedar City, follow signs for Utah Route 14, heading east towards Duck Creek, to junction of Utah 14 and Utah 89. Left on Utah 89, head north to junction of Utah 89 and Utah 12. Right on Utah 12, head east towards Bryce Canyon National Park. Continue on Utah 12 through Tropic, Cannonville, Escalante and Boulder. 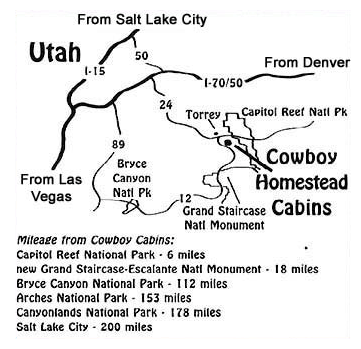 Cowboy cabins are located 33 miles on Utah 12 from Boulder. Depart Denver via I-70 headed west, enter state of Utah, continue on I-70 west to Utah Route 24 - Hanksville. Head south on Utah 24 to Hanksville. Utah 24 will change directions and head west through Capitol Reef National Park. Continue on Utah 24 west to the junction of Utah 12 (just outside the town of Torrey). Left onto Utah 12 and head south 3 miles to Cowboy Homestead Cabins. Depart Salt Lake City via I-15 South past Provo and Nephi then exit at Scipio. Take Route 50 south/east to junction with Utah 89 (just outside Salina). Right on Utah 89, heading south to Sigurd - junction with Utah 24. Left on Utah 24, heading south/east past Fish Lake, through Loa, Bicknell and Torrey. Just outside the town of Torrrey, junction of Utah 24 & Utah 12, right on Utah 12, heading south. Cowboy Cabins are located 3 miles south of the junction. Thank you for visiting https://www.cowboyhomesteadcabins.com:443/Location! Be sure and revisit cowboyhomesteadcabins.com frequently for content updates and more.